Despite hearing the call, not everyone up and left home. My grandparents were among the lucky ones. They heeded the call, though they did not know where their journey would take them. That decision would ultimately save family members and the generations that would follow. If Israel and Sonia had been told in that moment that they would one day number like the stars, they might not have believed you. 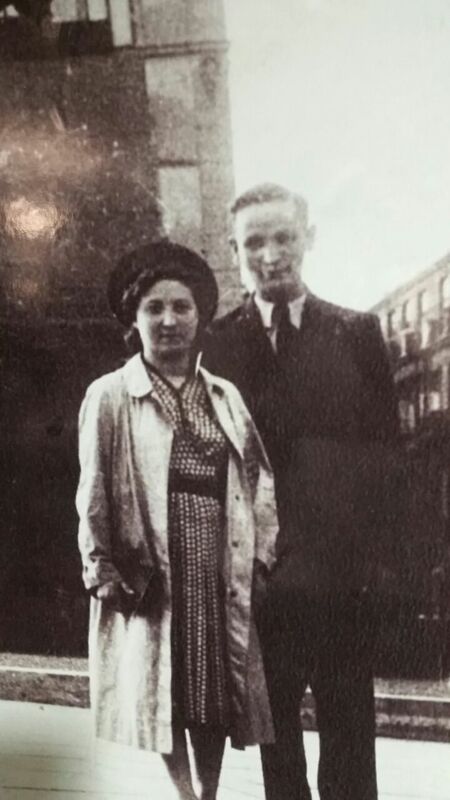 Today, as my grandfather once again shared tidbits of his story with me, he recounted the many times he cried thinking that his world was coming to an end: a father losing his job; a young boy sent off to a distant city to attend yeshiva; a journey with wife and brother in tow out of Poland; life in the displaced persons camp; an arrival in the United States. There were no guarantees of a happy ending, no assurances of survival. Yet, in retrospect, my Zeidy believes that none of the blessings he now enjoys would have been possible without those moments over which he cried. Faith is not synonymous with the belief in miracles. Just ask Abraham and Sarah! Their faith was not blind and without question. They did not rely on Divine Providence alone to make the future promised them come to fruition. So much of their fate was dictated by the choices they made and the actions they undertook, sometimes at great peril to themselves and their progeny. My grandparents don’t assert that God chose to grace them above anyone else. They don’t believe that God interceded to save their family from the harm that befell so many others. But faith in the power of working hard, loving well, doing good and taking responsibility for one’s decisions–and consequences thereof–can certainly bring one closer to the belief in a Divine plan. At least it has for them. The tension between our beliefs in Divine Providence and our own free will is constantly played out in the text of the Torah and in the narrative of our lives. Is God testing Abraham and us, leaving matters in human hands? Or is God the all-knowing One who is manipulating us as part of a grander scheme? I don’t have an answer to this question, but this much I know: If my grandparents’ lives were a matter of God’s intervention for some greater purpose, I have thanked God many times over. And if their journey has been one of their own making, with God kvelling all the while, I hope their legacy will be instructive for many generations to come. As for my grandparents and me, every “hello” is more precious than the last, and every “goodbye” is more difficult. So I have chosen to resolve the tension between fate and free will, between Divine plan and human agency, as only a grandson of Yisrael ben Avraham v’Sarah can: May we extend every “hello” as an offer of peace, a moment of appreciation, and an opportunity to change someone’s world for the better; and may we express every “goodbye” as a prayer for peace, a moment of reflection, and an invocation of God’s greater plan in our lives. Compassion and kindness, strength and faith…it is apparent in the way you express yourself and the way you live your life. I am grateful your sweet Bubbe and Zaidie survived. As I have said many times I feel blessed to be part of a community that sends and lives this message. Ever since I came to OJC I have been trying to absorb some of your faith and of Rabbi Drill’s. Am I getting closer? I think I am. But, sadly, I still have a long way to go. I strongly believe in your feelings of every hello and goodbye, but I also question why there were and are so many good people who could not receive God’s message. Please continue these blogs. They are so enlightening and do help me on my journey. Found this to be most inspiring. Family picture is outstanding!!! Found this article to be most inspiring! Family photo outstanding!!! Found this to be so inspiring. Family photo outstanding! !